Homeless animals... 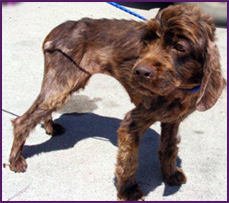 Abandoned animals… Sick animals that need loving care before they can be adopted. Some are born on the reservation. Others may be left by the side of the road by people passing through in their cars. Maybe they think their unwanted dogs or cats will “make it” on their own. But they won’t. Some will go wandering hopefully, in search of loving families, only to be hit by cars. Others will fall victim to the severe summer and winter weather. Some will even die from hunger. These tragedies occur every day on impoverished Native American reservations in the Southwest and Northern Plains. Rocca was very sick before receiving some much needed TLC. We decided NO MORE. No more dogs and cats hungry and alone … no more kittens or puppies struggling to survive in the severe weather … no more animals dying needlessly when we could help. Unfortunately, we can’t do that until they are in good health. You see, most of the stray animals taken in have medical needs. Most have fleas, and many have more serious ailments like broken bones, ear and eye infections and even wounds. They need help with urgent medical care first. 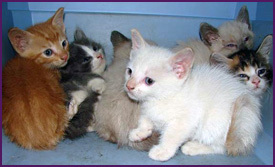 Once they are healthy, then they need foster homes, so they can get house-trained and ready for adoption. The costs for medical care and other expenses can easily rise to several hundred dollars for every dog or cat before they can be adopted. That’s more than many Native American families can afford … But what alternative do we have? Molly was just skin and bones when she was found. One step is to share kits with food and treats, collars and leashes, bowls, towels and blankets with foster care families who may have plenty of love to share but not a lot of available funds to purchase these items. This service, the RAR Program’s Foster Care Kits, helps provide more homes to animals that need them. We work with our Program Partners who take in homeless dogs and cats, give them immediate and urgent care, and finally match them to loving “forever” homes. And that is a wonderful goal. Even when their little bodies are broken… even when they are sick and frightened and have been on their own for weeks or even months… you can still look into their eyes and see how desperate they are for love. It is so rewarding to see how they respond physically and emotionally to the abundant tender loving care. Often, their very lives are saved by the efforts of Program Partners, foster care families, and our very generous supporters.